As a community we are sad to announce the passing of Doug Gowan, serving President of ALT, who died on 8 February. 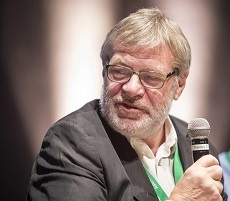 As former founder and chief executive of the Open Learning Partnership Doug was elected as Vice-Chair in 2013, serving as Chair the following year and in 2015 as President of ALT. As a Trustee Doug was instrumental in leading ALT through the transition from unincorporated charity to becoming a Charitable Incorporated Organisation in 2015. Doug also had a strong influence over re-defining ALT’s strategy in 2014, ensuring that the Association serves and represents all of its members. If you would like to share your memories of Doug or have other enquiries please contact Maren Deepwell maren.deepwell@alt.ac.ac.uk . Doug’s work for the Association and as a Trustee will be marked at the Annual General Meeting 2016, which takes place on 7 September at the University of Warwick.